The good news about squamous cell carcinoma is that it is very slow to metastasize; the bad news is that is locally very aggressive, eating through anything in its path. In addition because this cancer commonly occurs in the mouth, there isn’t a lot of space to easily remove it. 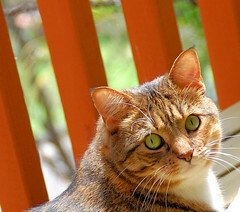 While I see more squamous cell carcinoma in cats it also occurs in dogs. Most squamous cell carcinomas occur in the mouth. However it is also a common cancer on the ears and noses especially of white or light colored cats who go outside in the sun. 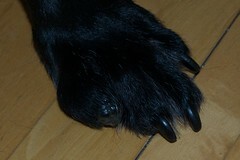 Another very common spot for squamous cell is in the toes of dogs especially black toed dogs. Squamous cell often starts with chronic irritation of infection. On the ears of cats it is often from repeated sunburn. In the mouth it is many times secondary to tooth issues and infections. The prognosis with squamous cell carcinoma is very good if you can remove the whole tumor but unfortunately this is many times not possible. Without removal, the prognosis is pretty poor and these animals experience a lot of pain if it works it way into the bone. However there are therapies that can slow things down and significantly improve quality of life. I am going to break this article into three sections and talk about squamous cell in toes, in the mouth and then a section on the other places squamous cell can form and a little about cats. Follow the links for more information about herbals and therapies. Most squamous cell carcinomas start on the toes as a broken nail or a non-healing infection in the nail bed. Often times a few rounds of antibiotics are prescribed before the cancer is diagnosed. I have only seen squamous cell carcinomas in black furred toes, however it is possible to get the disease in dogs of other colors also. In some dogs squamous cell causes infection secondary to the cancer and is some animals it is chronic nail bed issues and infections, which cause it to develop. The treatment of choice is to remove the toe as soon as the diagnosis is made. If the whole tumor can be removed then this is almost always curative. Many dogs will be done at this point and can live normal lives however I have had some dogs who go on to form multiple cancers in other toes, usually this is because their immune system is not working correctly and also most likely has a genetic component. Occasionally surgery is not an option to remove the toe because of poor health or heart conditions and then other treatments need to be used. I treat a wonderful happy Gordon Setter named Hudson, known to most of those who love him as Huddie. He has lost three toes to this disease and also has Cushings disease, which makes his immune system not as strong as a normal dog. With Hudson we have developed the following protocol, which I recommend for any dog who has had multiple squamous cell carcinomas in the toes. Artemisinin – I have found artemisinin to be very effective in slowing squamous cell down. Mushroom supplements – these help to strengthen the immune system and have anticancer properties. I recommend a supplement with a combination of Maitake, Shiitake, Reishi and Cordyceps mushrooms. Bu Zhong Yi Qi Tang – this herbal helps to move blood down into the toes and extremities and also has some strong anti-cancer herbs. In Hudson’s case we also have him on long-term antibiotics. It seems like his squamous cell started with chronic nail bed infections that could not be cleared with antibiotics once they took hold. As much as I would prefer not to use long-term antibiotics, in his case I believe they are a good precaution. This is not a recommendation I make in every dog. Acupuncture – we know Hudson has a weak immune system so we try our best to strengthen what is there with monthly acupuncture. Acupuncture – can help to slow down progression of this disease and help with pain. If there is active cancer treatment should be at least every two weeks. Xian Fang Huo Ming Yin – this can be a powerful formula for treating active squamous cell carcinoma in the toes but should be used with caution, as it is very cooling. Never use this in a very debilitated, weak or cold dog and always check with a holistic vet before using it. (no article up yet). Hoxsey like formula with boneset or its gentle cousin Cancer Detox Support – this can also be a very powerful formula against squamous cell, like XFHMY this formula is very cooling. See link for more information. Boneset should be added to this formula to control bone pain. Antibiotics – many times there are secondary infections in these dogs. Antibiotics are often needed. Prednisone – this western drug can help slow this cancer down although it also has some side effects. Talk to your vet about if it is a good option for your dog. So on to Squamous cell carcinoma in the mouths of cats and dogs. This is a horrible place to get a squamous cell carcinoma. The only way to get a cure is to remove a fourth of the jaw if it is in the lower jaw and there is no such option if it is in the upper jaw. Because this disease is so painful many animals will not eat and that is usually the factor that ends up ending their life. That being said I have seen animals do well for about a year after diagnosis, with integrative treatments. Usually dogs do a little better than cats, who usually don’t make it a year. This really varies animal to animal and involves being able to medicate an animal with a painful mouth. How can we help these animals with squamous cell in the mouth? First let me start off by saying in cats I often times just rely on injectable antibiotics, steroids and pain meds plus acupuncture. The amount of pain with oral administration of herbals is not worth any benefit we get from my experience. Occasionally I recommend oral pain meds as well. Below anything oral is mainly for dogs. Consider removing part of the lower jaw if it is in that area. I know it is a large and very harsh sounding surgery but these animals usually do quite well. This surgery is not for everyone so if you can’t do it there are other options below. Prednisone – I know it is a western drug and yes it has side effects but it really slows things down and also stimulates appetite in the process. This is one place I highly recommend considering it. Artemisinin – this herbal can really help slow things down. I treated a little Pomeranian named Panda who lived quite well for over a year on just Artemisinin, antibiotics as needed and pain meds. Acupuncture– can help with appetite, pain and slow this cancer down. Usually treatments need to be no more than two weeks apart. Hoxsey like formula with boneset – can help to slow this cancer down and help with bone pain. Pain medication – these animals need pain control! Antibiotics as needed. Having squamous cell in your mouth is like having a giant ulcerative wound open sometimes even up into the nasal passages. Antibiotics are sometimes used long-term and sometimes just as needed. Squamous cell can also arise other places in the body. The ear pinnae of white cats are a very common place and also the tip of the nose. Many people will make the decision to remove the ear pinnae and get a cure. For the nose usually a few radiation treatments is curative. Usually squamous cell on the pinnae or nose is slower moving then in the mouth and sometimes if the cat is old the decision will be made to just leave it. When squamous cell occurs other places, surgical removal is the treatment of choice if at all possible. If surgery or radiation is not an option then the treatments above can be used. 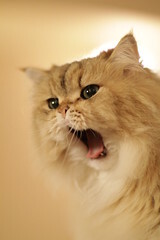 In many cats giving more than three drugs or herbs can cause side effects and reduced appetite. Depending on how many western treatments a cat is on usually I only recommend adding in two or three herbals and focusing on diet and acupuncture to supplement their effects. Some cats cannot tolerate anything going in their mouth if they have cancer there in which case I only treat with acupuncture to try to make them have quality of life while they are here. If only one thing can be given it should be pain medication as this is a very painful disease. As with all articles on this website please check with your animal companion’s veterinarian before starting any herbals or supplements. This disease more than any other of the cancers I have talked about really needs an integrative approach to treatment involving western drugs and interventions. I can’t say enough about the power of acupuncture for animals with cancer! Of all the work I have done with this disease I am still amazed at how well acupuncture can help these wonderful animals live with cancer. I love being able to make animals feel better and it brings tears to my eyes to be able to help the people I work with have their beloved animals for longer. Currently I have a number of animals who are living, and living well, more then a year out, with cancer that should have taken them in a matter of months. 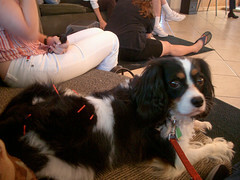 When I first became an acupuncturist I took over doing acupuncture for an amazing dog named Rooney. Rooney had been diagnosed with bladder cancer about 4 months before I meet her and she was supposed to be gone within three months of her diagnosis, even with the chemotherapy she was getting. I started treating her every week and over that time was blessed to get to work with one of the most amazing dogs I would ever meet and her wonderful moms. 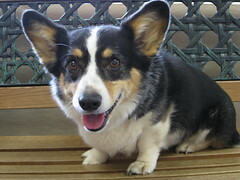 Rooney was not supposed to live but she made it almost three years with chemotherapy and acupuncture. She was rarely sick during that time and she lived a very normal dog life up until her last month. See Rooney’s Wisdom. Rooney is unusual in that I only worked with acupuncture with her and not herbs. For most of the animals I treat I recommend an integrated approach that combined acupuncture, herbs and often times some western treatments as well. The wonderful thing about acupuncture is that there are not major side effects like with chemotherapy, surgery and even some of the herbs I use. Because of this, it can be used in some of the most sick and old animals. Although I find it works best if it can be started before an animal is severely debilitated. So what are the main benefits of acupuncture? Increased longevity – almost all the animals I treat for cancer end up living much longer than the normal prognosis, usually at least double prognosis time. In some animals this ends up being years beyond prognosis. For a treatment with no major side effects this is pretty amazing. Increased well being and energy – acupuncture can increase energy and help to regulate the hormones in the body. Cancer can make animals feel sick – acupuncture helps to reverse this. This is the most important benefit I see with acupuncture treatments. 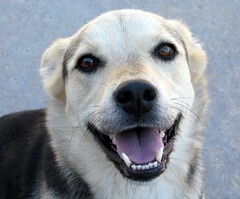 Animals are happy again and people feel like they have had their beloved companion returned to them. Decreased pain – cancer can be painful. Acupuncture can significantly reduce that pain and help to reduce side effects to some of the pain drugs. I had a dear little bunny I treated who had a very painful spinal tumor. With acupuncture every two weeks we were able to keep him happy for about six months. Immune system support – cancer is a failure of the immune system. Acupuncture stimulates the immune system so that it can fight the cancer better.In some animals, I have actually seen tumors shrink with just acupuncture alone. Increased blood circulation – to the cells you want to get blood. There is some thought that acupuncture can help to pull blood away from cancer cells and give it to the parts of the body that need it. Often times with cancer the body ends up without enough nutrients and energy because the cancer takes it all. Acupuncture helps to reverse this. Increased appetite – some animals with cancer feel so sick that they don’t want to eat. Acupuncture can help to stimulate appetite. Chemotherapy and radiation support – both these therapies are very hard on the immune system and body. Acupuncture helps to keep white blood cell numbers up during these therapies and helps decrease the side effects. If white blood cells drop too low, chemotherapy needs to be stopped. Acupuncture can usually raise blood cell numbers within a week. How often should an animal with cancer be treated? I recommend scheduling acupuncture treatments at least every two weeks. In some very sick animals I will recommend weekly treatments and I usually start with weekly treatments for a few weeks. I have a few animals I have treated every three weeks and I had one dog who did very well with monthly treatments but over all I have found animals do much better with weekly or every other week treatments. The acupuncturist you work with may have different experiences. Where do I find a veterinary acupuncturist to treat my animals? The best tool I have found is through the International Veterinary acupuncture Society’s website. Find a veterinary acupuncturist in your area. I should note that all good veterinary acupuncturists are not on this list. I’m not because the certification program I went through is not recognized by IVAS. In addition someone being listed just means they are certified by IVAS or one of its recognized programs, not how experienced or good they are. Ask around in your area to see if there is someone that is highly recommended. Ask your vet, at the local pet store, at the dog park, at the local groomer or among friends and co-workers or search the Internet. When is the best time to start acupuncture? Now! Really as soon as possible is best. It is much easier for me to keep an animal from getting sick then try to make them better after they are very ill.
My normal vet or oncologist says I should not do acupuncture or alternative medicine with my animal? What should I do? Most vets I have worked with are very open to what I do. 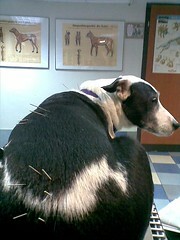 In my state and in most states you need to be a veterinarian to do acupuncture on animals. I think that helps us have more support from the mainstream vet community. Since most vets don’t have training in acupuncture or herbal medicine sometimes they just need a little communication. I am always happy to talk to someone’s regular vet or oncologist if there is a conflict when I am working with their animal. Hopefully your veterinary acupuncturist will be willing to also. While I am not always as current on western treatments for cancer, I am usually much more current on the herbal studies and the studies about combining western and alternative medicine. Should I use acupuncture with chemotherapy? Yes! I have found that animals getting acupuncture with chemotherapy not only do better with fewer side effects, but also live longer. But I don’t want my animal to suffer longer? What if acupuncture helps then to live longer but they are miserable during that time? I have found that the animals I treat with acupuncture live well and die fast when it is their time. The quality of life while they are alive is usually quite good and they are happy. I have found that when it is time to go they tend to get sick quickly and the passing seems to be easier for both the people involved and the animals because it is so obviously time for them to pass on. What if I can’t find a veterinary acupuncturist in my area? While I do think acupuncture works better than acupressure, I think there is a lot of benefit to acupressure and it really can make a large difference in an animal’s health. See if you can find someone who does acupressure treatments or learn yourself. I will publish an article in the near future about how to do acupressure for cancer. 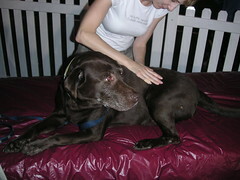 Tallgrass Animal Acupressure Institute has a tool to find a practitioner and offer classes in acupressure. 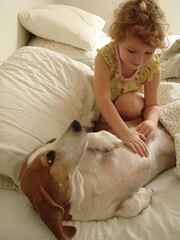 Find an animal acupressure practitioner. I think there will come a time in my life where we will look back on some of the harsher treatments we use for cancer as being somewhat barbaric. Many of the new treatments emerging work by getting the body to fight cancer itself. There was an amazing article I just read about using modified white blood cells to get rid of leukemia. New leukemia treatment exceeds wildest expectations. Acupuncture fits nicely in with some of these emerging new therapies. Acupuncture supports the body and helps it to do what it should have been able to in the first place, fight cancer. Most importantly it helps to support our animal friends in their journey through cancer treatment. It helps them to live and love living and gives us more time with them. For me there is no greater joy than seeing that sparkle come back into a dog’s eyes that says I choose life! Return to Integrative and Holistic Methods for Treating Cancer in Cats and Dogs. My animal companion has to go under anesthesia – what can I do to help? If we are lucky our animal friends only have to go through surgery once, when they are spayed or neutered. However many animals do need to be under anethesia other times either for a dental cleaning, to get sutures, or to have surgery. Whatever the reason, surgery and anethesia are hard on our animal friends. But there are things you can do to help them recover faster and more comfortably. As always, check with your veterinarian on any supplements you use. Arnica is a homeopathic remedy which helps with bruising and trauma. Over the years I have been amazed and impressed at how much difference this very safe remedy can make in healing. I have seen incisions heal in half the time and dogs have very little bruising and swelling in situations you would normally expect to see it. I always recommend Arnica for all my animal patients who have to undergo surgery or any other procedure that there will be tissue or bone trauma. Because it is a homeopathic remedy it is very safe ever for old and debilitated animals. I use the Arnica 30c pellets and dose them at 2-3 pellets (usually 2 for cats/small dogs and 3 for dogs) the morning of surgery, the evening after surgery, and then three times a day for three days. Because the pellets are so small they can safely be given the morning of surgery. Arnica can be bought at most health and supplement stores or by clicking on Arnica. I highly recommend an acupuncture treatment right after surgery or anesthesia. Acupuncture can help with clearing anesthesia from an animal’s system and decrease the chance of them having a hard recovery. Acupuncture can also help ease pain and speed healing. If possible acupuncture can be performed the day of surgery after an animal has woken up. Many times this is not possible because of the hours acupuncturists work and I end up treating most animals the day after surgery. Acupuncture can also help dogs who have had bad recoveries to anesthesia in the past and and make it possible to perform dentals or surgeries on these sensitive animals. While I don’t recommend Yunnan Baiyao (also called Yunnan Paiyao) for all animals undergoing surgery or anethesia, it is still one of my most important herbal formulas. I mainly use it in any procedure or surgery where there is a concern about bleeding. This includes many tumor removal and abdominal surgeries. I have seen this wonderful herbal formula save animal’s lives before. Please see my article, A Magic Vial of Yunnan Baiyao and the wikipedia article. I usually dose Yunnan Baiyao at one capsule twice a day for a few days before and after surgery for your average sized dog. Cats and small dogs, I use the powder and put about a 1/8 of a teaspoon in their food twice a day. Yunnan Baiyao can be bought in most international districts and by clicking on Yunnan Baiyao above. If one of my animals need to undergo surgery I always give them a reiki session before to get them into a good place for surgery. I usually work with a local practitioner, Rose DeDan, who also does animal communication. She is able to help explain what is going to happen and put their body in the best possible place for surgery and/or anesthesia. Enough can not be said about pain medication. Make sure your veterinarian gives your animal pain medication before surgery and sends you home with something you can give at home. Nothing is worse then seeing our animals in pain and not being able to do anything about it. Routine dentals do not usually need pain meds. You are the safest person to your animal. They want to be with you after surgery and they want to feel loved and cared for. 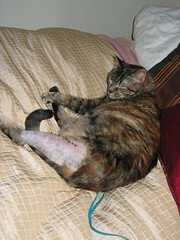 If possible consider taking a day off work after their surgery or plan your animal’s surgery or procedure on a Friday. It is so important to have somewhere safe, quiet, warm and soft to recover after surgery. Anesthesia can make the senses more sensitive and many animals get headaches coming out of surgery. Often times the drugs used also make our animal friends disoriented. Make sure that there is no access to stairs and nothing to fall off of. Keeping lights dim and sound to a minimum also helps. Sometimes classical music played softly will help relax our friends. I hope these simple suggestions are helpful! I know they have helped many of the animals I work with and my own beloved animal companions. Posted in health | Comments Off on My animal companion has to go under anesthesia – what can I do to help? It’s sad to see our animal companions no longer be able to do the things they once could do as they age and grow older. 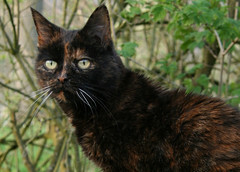 All older animals have some amount of arthritis, although some have many more problems with it. Unfortunately, Western medicine has very few options for treating arthritis and uses mostly drugs, to treat the pain. This is starting to change with some veterinarians doing stem cell and plasma rich platelet injections. However these treatments can still be expensive. Ask your vet about if these treatments are right for your dog. Some animals are not able to tolerate these drugs and many times animals are on three different drugs and it still isn’t enough. 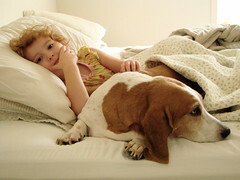 In some animals arthritis manifests as weakness caused by the inflammation pushes on the nerves. Many dogs walk around like their feet are asleep, tripping over things, stumbling and no longer having the strength to jump into the car or onto the bed. Unfortunately because they can no longer walk as far or do as much as they used to, their muscles start to atrophy or waste away, causing a vicious cycle. As the weakness increased, they do less, which causes more atrophy from disuse, leading to more weakness and more atrophy and less activity. In the end many of these animals can no longer get up on their own or even take a short walk. 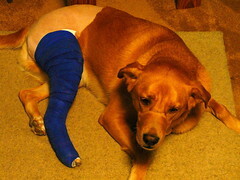 In other animals arthritis will manifest as pain, which can also prevent movement and cause the weakness/atrophy cycle. Many of these animals will become moody and withdrawn and may even snap and bite at their people out of fear of pain. It is so hard to see our friends have so much pain that they no longer want our affection. In most animals there is a combination of pain and weakness. So what do we do for our friends to help them live out their old years happy and pain free? Acupuncture Being an acupuncturist, I always recommend acupuncture first. Of course, this is also because I have seen how well it works in the animals I treat. I often find that if I can work with animals when they first have problems, they do so well, I only need to treat them every one to three months. Unfortunately most of the animals I see have had problems for a while and their people only learned about acupuncture when they had tried everything that western medicine had to offer. In these animals, acupuncture can still work and work well but usually treatments need to be closer together. It is so nice to see these animals happy and able to enjoy life again! Hydrotherapy is a great option especially in dogs who have muscle atrophy. Unfortunately it cannot be done with cats, although Sheila Wells at Wellspings has told me they have worked with rabbits before. Hydrotherapy is done in a small swimming pool and involves massage and physical therapy in the water. I have seen excellent results with hydrotherapy especially combined with acupuncture. Hydrotherapy helps to rebuild muscles, increase range of motion and work out sore and sensitive areas of the body without the impact on the body of exercise on land. My favorite pool is Wellsprings in Seattle Washington. They have a great website with lots of information and photos that I love to refer people to. Click on the link to check it out! 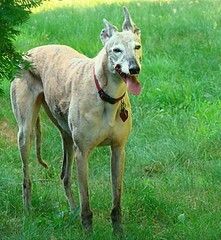 I have worked with Chinese herbs with many of these arthritic dogs and some cats. The combination of acupuncture and herbs usually helps with pain and movement and helps animals maintain between treatments. I rarely use Chinese herbs in cats because they are very sensitive to them and it is hard to medicate cats. I sell an senior dog herbal formula called Senior Dog Support, through my etsy shop, that helps with arthritis pain and improves blood circulation into the joints. Your holistic veterinarian may have something else they recommend. The Omega 3 Fatty Acids in fish and cod liver oil actually helps decrease arthritic inflammation in dogs (not true for cats although it helps with other things). 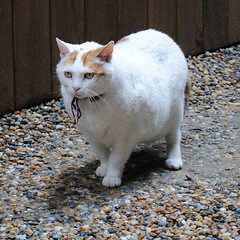 Adding a little fish oil to the diet can help many animals.My favorite brand is Nordic Naturals – Pet Cod Liver Oil . Nordic Naturals is one of the best brands for quality and they test for heavy metals and contaminants. These supplements help to decrease inflammation and rebuild damaged cartilage. They are often sold in combination. The nice thing about these supplements is that they have few side effects and are very safe. Some animals have a wonderful response to them and some have almost no response. It usually takes a month to six weeks to see if your animal will have a positive response. Adequan, similar to glucosamine is also available in an injectable form and works better in some animals. 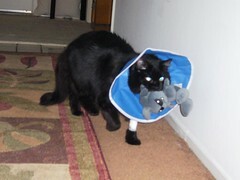 It is also a lot easier to give to cats who are hard to medicate daily. After the initial series of injections it usually only needs to be given once a month. Adequan can only be purchased through your veterinarian. My favorite glucosamine product is Sea Mobility Beef Joint Rescue jerk treats , they work well and are very tasty. There are other good ones out there. Infra-red light therapy – Infrared light helps ease the pain of arthritis in joints and increase blood circulation to the area. It is very cheap to do and can be done at home. See my article Infrared Light Therapy for kidney failure, incontinence and arthritis. Many animals have subluxations of their spine especially as they age. A good chiropractor can often help with mobility and pain. I have found that chiropractic adjustments work best in animals with a very tight back and more pain then weakness. For my own cat, chiropractic adjustments have worked better than anything else we have tried and have made his life much better. Make sure you find a chiropractor who is used to working with animals and knows animal anatomy. Massage can help to loosen tight muscles and increase blood circulation. It also can help with pain.We know it works for us, why not for our animal friends. Once again make sure you find a massage practitioner who is certified to work with animals. I have two amazing massage therapists I work with in Seattle, Kim Rogers and Jen Streit. Kim also does humans! Acupressure works with the acupuncture points and helps decrease pain and relax muscles. Reiki/Bowen/Polarity/Craniosacral and other energy therapies These therapies help stimulate the body to heal and can decrease pain and improve quality of life. Since there is little regulation of these therapies it is important to get a referral before seeing someone. This is especially true of Reiki since there are so many people who practice it. A good practitioner can make a huge difference in an animal’s quality of life. It is better to do one thing and stick with it than to jump around between therapies. 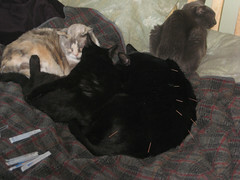 Often times animals will began with me doing acupuncture and herbs and then we will add in other therapies as needed. 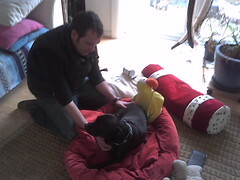 If I can’t help an animal with acupuncture I will refer them to another practitioner to try something else. Don’t make too many changes all at once in an old animal’s life. Go slowly instead. Treating Serena today. She was very resistant, trying to get away and glaring at me. Finally I offered to take her static head energy away but I told her it was up to her how much to give me. She began to calm down and started purring. She was ok with that as long as she was in charge. She also didn’t want me to tell her mom what I was doing. Somehow it was important to her to not only be in charge but to not have me be viewed as the healer. This was about her not me. When I came to visit her a month ago she was ready to leave. She had this amazing headache and was very open to me removing it because she had given up and just wanted the pain to end. Many times with animals they need to feel what it feels like not to have pain before they can get there themselves. This visit she felt better and was ready to be in charge again. A few months after I wrote this Serena passed away from complications from her brain tumor. I’ll always remember her as being the spunky blond girl she was, very confident, loving, and opinioned. Another little dog I work with named Buddy came to see me a couple years ago, in extreme pain and desperation after re-injuring his back and becoming unable to move his back legs at all. He would have happily left this plane of existence at that point. After I was able to work with him and decrease the pain and get a little bit of sensation back in his legs he was a whole new dog. He was ready to live again and he knew he could get better. And he did in happy little steps along the path of healing until today he walks almost normally again. He believed what he felt and used that to heal himself. Us humans are so focused on words that we don’t often pay attention to the real cues our bodies are sending us. These are the cues I work with when I do acupuncture treatments. We end up with thought patterns stuck in our heads which tell us what we should feel and believe. Many times these develop from what doctors or family members have told us and aren’t even our own thoughts. We tend to believe these thoughts more than the reality of what we are actually feeling. Often these thought patterns are harder to change than to just deal with the pain or disease. In humans, treating chronic pain involves both the body and the mind. How many times have you been sick or hurt and not listened to your body telling you to slow down or do less? And then ended up getting sicker? Animals don’t argue with what their body is telling them, they just do it. I know I still have a lot to learn about this from the animals I work with. With animals they believe what they feel so if you show them they can have decreased pain they will respond and believe that with their whole body and not just their minds. Animals don’t get stuck in their heads in the same way we do and because of this they can be present with the current moment and have no attachments to what the next moment will bring. In my work, I help these animals find the healing energy that is already there. Their bodies know how to heal, but sometimes they need help in finding the way. Once they know the direction to go, they naturally travel there themselves, I just give them a hand to hold along the way. Maggie tries really hard to be a good guard dog. When you come to the door of her home, you can hear her barking in a strange muffled way, which makes you wonder until the door is opened and you realize she has a teddy bear in her mouth. That being said Maggie loves people and once she meets you she is all smiles, teddy bear or no teddy bear. Maggie has a way of smiling with her eyes that just draws people in. When I meet Maggie she had been diagnosed with osteosarcoma or bone cancer in one of her front legs. At the time her family were exploring options to treat her but one thing was almost certain, regardless of treatment, in a year she would no longer be with us. Bone cancer has a very poor prognosis, usually causing death within three months with no treatment and within 6-12 months with aggressive treatment. I could tell when I met Maggie’s family how important she was to them. Her family lived in a wonderful older home with one of those grand living rooms and they really liked having photos of those they loved in this space. When I walked in I immediately noticed that there were as many photos of Maggie and the kitties of the household as there were of the human family members. Her family told me how difficult it was for them to have Maggie sick because their previous dog had died of lung cancer and now Maggie also had a cancer that usually spread to the lungs. We talked for a long time about the options that were available for Maggie. They had already seen an oncologist and had set up appointments for radiation and chemotherapy but they really were hoping for some way for Maggie to completely beat the cancer. I always like to give people hope and tell them that not every animal follows the textbooks and that acupuncture can sometimes dramatically change the course of an illness but at the same time I try to be realistic. I explained that we could probably double Maggie’s time here and make her feel better but that it would be unlikely that we would completely get remission. I remember looking at this beautiful dog so full of life and her family who loved her so much and thinking that it was so tragic that she would not make it to old age. As time passed Maggie did not get sick but she did become incredibly painful because of the tumor in her leg. I would show up to treat her and she would no longer get up most of the time. When I looked in her eyes, I saw so much pain. I felt so bad that not even the strongest drugs we had and the acupuncture could keep the pain away for her. Amputation became the only option to stop Maggie’s pain but what a difficult decision. I saw her family struggle with the decision of what seemed like a major mutilation of her body to them. Maggie had lived almost a year with the cancer at this point and by everyone’s assessment she was supposed to be gone by now. Was it worth doing an amputation only to have her die a few months later? Amputation is one of the hardest decisions for an animal’s human companions to make. So many thoughts go through their mind. Will they still be whole? Will they want to be alive with only three legs? Will they still be able to do the things they love? Will they understand why I did this or hate me for taking away a part of their body? One day Maggie got up and when she stepped down on her front leg it broke right in two. The cancer had weakened the bone so much that it could no longer support her weight. At this point it became a much easier decision to make and Maggie had the leg amputated almost immediately. With three legs, Maggie may not be able to go for long walks like she used to and the stairs are sometimes hard for her to navigate but Maggie greets each day with a playful spirit and a happiness to be here. She loves to greet neighbors who walk by and many people in the neighborhood know her as the dog that cancer could not take. These days I do not treat Maggie as often and our main concern is keeping her legs healthy so she can continue to get around. I feel like coming to treat Maggie is like seeing an old friend. She rolls over on her side after the needles are in and I stroke her belly and neck. If I stop for even a moment she lifts her head to look at me with those big eyes, “please don’t stop.” There is a familiarity and a comfort in visiting Maggie and it feels like I have been included in her special family of people who she shares her happiness, love and the journey of her battle with cancer. It has been almost two years since Maggie lost her leg and close to three since she was diagnosed with cancer. This happy golden retriever with the sparkling brown eyes has beaten the odds. 2/17/2011 Update. It has been over two years since I wrote this and Maggie is still cancer free and doing well! 1/18/12 Maggie sadly passed away a couple days ago. She was almost 13 years old and it had been almost six years since her cancer diagnosis. We are all grieving for her, she was very loved. 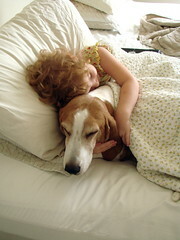 Please visit Maggie Rose a beautiful poem written in honor of Maggie by her human father. When I first started my career treating animals, I would greet them and say, “I want to take away your pain and suffering. I will pull it out of your body and then you will be free of it.” I remember towards the beginning of my career I met a dog, who was boarding at the clinic, who couldn’t walk and was very painful. It was a slow day and so I decided to do about an hour of energy work. After that hour to the amazement of the technician, who jumped up like she had seen a ghost and shouted,” Fred’s walking,” he stood up and walked out the door. However he only continued to walk for about two days and when I worked with him again he only ended up with about a day of relief. I remember being so frustrated that I had tried so hard only to have him get worse again. But I was just removing pain, not helping him to work with it himself. I don’t know, if I had know what I know now, if I would have been able to help him get better or not, but the approach I was using then did not work. The relief I gave him clearly did not last. In addition it took a large toll on my body to work this way and I would physically hurt and weaken myself to take the pain away. I would also have animals who would get upset and not let me work with them; anytime I would try they would pull away. Their pain was part of them and I was acting like that part of them was bad and that they were not whole. They wanted to learn how to live with their pain and work with it, not for me to magically remove it. I was also invading their personal space without their permission. I have since realized that what animals want is compassion and acceptance. Isn’t this what we all want after all? They want help but also they want to be involved in the process of healing their illness. They have their own wisdom that needs to be respected and listened to. I have learned to approach animals I am working with and say,” I will sit with you and be here for you; together we will look out from the same place (and not me staring at you like there is something wrong). From this place of togetherness, we will explore how I can help you work with your illness/pain and see if there is a way that I can help you to heal yourself.” Not only have I found that this works best in the long run and I don’t hurt my own health but animals are much more open to working with me. Like us all, animals have an amazing ability to heal themselves and to deny them the opportunity is stealing from them an amazing experience for growth. Through their own path of healing they grow stronger. Through this strength they are able to show us what it means to fully live with illness and heal from illness.